The last week and a half have been stressful. There was a car accident and my car being totaled. My computer died (Apple brought it back, but it has one foot out the door). A friend stayed with us and I had to make my sewing room into a sleeping room. And I had to learn the internets. Look around. You will notice that my blog looks EXACTLY THE SAME. 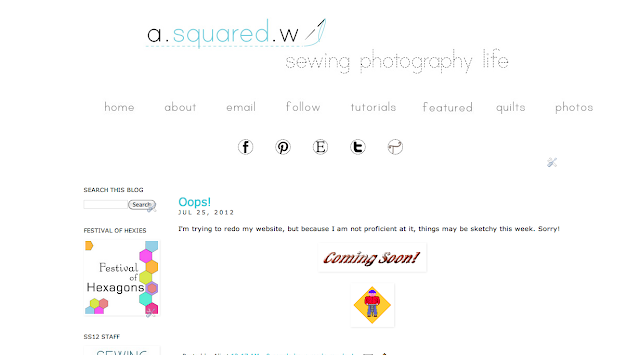 I like my blog and am not ready to switch things up. That was actually the hard part. I want some features that I need a web hosting service for, but I love Blogger. I didn't want Wordpress because there aren't many free templates. I also love Gmail and didn't want to use their email hosting service. So here are the details. iPage is more expensive than Google Apps for domain registration, plus I already had the domain. Want to keep your Domain with the original registrer and get a web hosting service? You'll need to change the DNS with the Domain Registrer. If you bought from Google, sign in to Apps and it will direct you to ENOM. From there change the DNS servers to the ones provided by your hosting service (custom setting). iPage wanted me to pay for mobile email. WHAT?!?! Lame. Plus my email address was already configured with Google and pushed to all my mail apps. Why change? This was tricky. Under DNS settings (at your web host), you have to update your MX settings. You'll also have to remove some CName and A Records. I am by no means a web designer or expert, but if you have any questions I'd be happy to try to answer them. Yikes, sorry to hear about the car accident, but very glad to hear you are okay. The internets are the joy and bane of my existence. I don't get them. Like you, everything I do takes me about 3 days to figure out. I see why people pay money for other people to do this stuff. It only takes them 30 minutes, but the rest of us lose a week of our lives. Of course, when the zombie apocalypse comes, they will be screwed. Internets won't be able to help 'em then. Just READING this gave me a headache. I just now decided to happily pay for any future blog design/re-designs I might do. yuck! all of that sounds like yuck! Internets are way too complicated for me. I'm lucky to have a Brother In Law who knows 'stuff' and manages my blog for me. And as for the car accident, are you ok? Is there a prius in your future?